This is one of those plants that I've actually never grown, but have heard so much about that I had to get some when I found out they were available. One of the smaller ornamental onions, it forms small, attractive, chive-like tufts of foliage that barely reaches one foot in height and provides wonderful texture throughout the growing season. 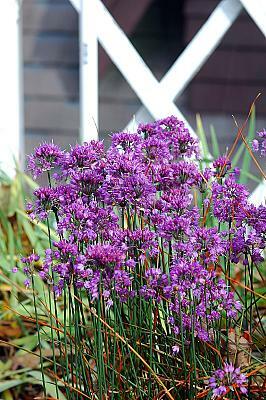 Fall is when it really shines, producing 2" wide clusters of red-violet flowers on thin stalks above the foliage. Most onions bloom earlier, so it's a treat to have one so late in the season! When the blooms are done the foliage gradually senesces into stunning tones of golden orange, adding even more color to the autumnal landscape. It's quite easy to grow in average soils, but it drainage is probably the most important factor in its survival. It will readily take excess water if available and is happiest in full sun, but can tolerate a little bit of shade. Try a cluster of three in front of Nepeta ucranica.